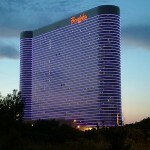 Tournament officials for the Borgata Poker Open took a calculated risk by dropping the entrants-fee from $10,000 to $3,500, and guaranteeing a $2 million prize-pool. And after day 1a the results the verdict would be: So far so good for the organizers of the Borgata Poker Open. Day 1a attracted 326 players (an amount many WPT events would like to draw for their total field) and day 1b is always a bigger draw. Needing only 571 total entrants to reach the $2 million guarantee, it appears the tournament’s gamble has paid off. It will be interesting to see if Borgata’s success translates into other venues taking similar measures –using guaranteed prize-pools and dropping the buy-in—to boost numbers and bring back the hype and popularity the WPT had when it burst on the poker scene. This entry was posted on Sunday, September 20th, 2009 at 8:36 pm and is filed under Poker News. You can follow any responses to this entry through the RSS 2.0 feed. You can leave a response, or trackback from your own site.